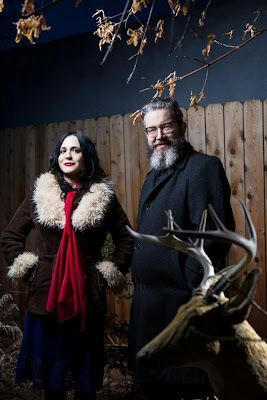 Husband and wife duo Brett and Rennie Sparks, The Handsome Family has unveiled a brand new song ‘Spider’ from their upcoming full length album “Wilderness,” due out on May 14th via Carrot Top Records. A companion book, also titled Wilderness, features original artwork and essays by Rennie Sparks. A deluxe box edition of “Wilderness” includes a 12”x12” full-color edition of the book, the LP with an 11”x17” color poster and six-postcard set featuring Rennie Sparks’ art. A black and white edition of the book will be will be published by The Handsome Family.